I'm pleased to announce version 1.4.0 of libbson and libmongoc, the libraries constituting the MongoDB C Driver. This is a very big release a long time coming. The headline feature is support for the TLS libraries included in Mac and Windows, so you no longer need OpenSSL there. Hannes Magnusson built this feature off contributions by Samantha Ritter and Mark Benvenuto. He overcame months of frustrations and roadblocks to achieve a secure, production-quality implementation; it's an extraordinary achievement. bson_reader_reset seeks to the beginning of a BSON buffer. bson_steal efficiently transfers contents from one bson_t to another. Fix Windows compile error with BSON_EXTRA_ALIGN disabled. Potential buffer overrun in bson_strndup. bson_oid_is_valid accepts uppercase hex characters. bson_json_reader_read aborted on some invalid Extended JSON documents. All man page names now begin with "bson_" to avoid install conflicts. Error messages sometimes truncated at 63 chars. This feature may change between now and libbson 1.5. The driver can now use the native TLS and crypto functions included in Mac OS X and Windows. OpenSSL is no longer required for TLS or authentication on Mac or Windows. By default, OpenSSL is used if available, the default will switch in version 2.0 to prefer native TLS. cmake "-DENABLE_SSL=WINDOWS" -G "Visual Studio 10 Win64" "-DCMAKE_INSTALL_PREFIX=C:\mongo-c-driver"
All of the TLS implementations now load the native default certificate store, with OpenSSL on Windows falling back on the Windows native certificate store if no other can be found. The "ca_dir" field on mongoc_ssl_opt_t is only supported by OpenSSL. All other fields, including "pem_file", are supported by all implementations. A new field, "allow_invalid_hostname", has been added to mongoc_ssl_opt_t and is preferred over the existing "allow_invalid_certificate" to disable hostname verification. See the documentation for mongoc_ssl_opt_t for details. The driver now supports the latest OpenSSL 1.1 in addition to past versions. The driver implements the MongoDB Command Monitoring Spec. Applications can record the duration and other details of every operation the driver performs on the server. See Introduction to Application Performance Monitoring in the docs. New functions mongoc_client_set_error_api and mongoc_client_pool_set_error_api allow applications to distinguish client and server errors. See the "Error Reporting" doc. Unacknowledged writes (writes whose mongoc_write_concern_t "w" value is zero) now reply with an empty document instead of one with nInserted: 0, nUpdated: 0, and so on. Now that these public APIs are available, the PHP drivers no longer define the MONGOC_I_AM_A_DRIVER preprocessor symbol to access private APIs. The symbol is removed from C Driver headers, and libmongoc-priv.so is no longer installed. New connection string option "localThresholdMS". zSeries, POWER8, and ARM 64-bit platform support. Performance enhancements, reduce allocation and copying in command code. All man page names now begin with "mongoc_" to avoid install conflicts. cmake "-DENABLE_AUTOMATIC_INIT_AND_CLEANUP=OFF" -G "Visual Studio 10 Win64" "-DCMAKE_INSTALL_PREFIX=C:\mongo-c-driver"
In this configuration, applications must explicitly init and cleanup libmongoc. mongoc_client_get_database_names no longer filters out a replica set member's "local" database. mongoc_client_get_gridfs now ensures the proper indexes on the files and chunks collections. SecondaryPreferred fails if primary matches tags but secondaries don't. mongoc_collection_find_and_modify_with_opts can return true on writeConcernError. mongoc_collection_validate doesn't always init "reply". The strings referred to by mongoc_ssl_opt_t, like pem_file and ca_file, are now copied into the client or client pool by mongoc_client_set_ssl_opts or mongoc_client_pool_set_ssl_opts, and need not be kept valid afterward. mongoc_collection_count_with_opts ignored flags and read_prefs. minPoolSize of 0 should mean "no minimum". mongoc_database_create_collection should always use the primary. The GSSAPI properties SERVICE_NAME and CANONICALIZE_HOST_NAME are now properly parsed from the URI, see the "Authentication" doc for details. Comprehensive compatibility with various C standards and compilers. mongoc_bulk_operation_execute didn't initialize "reply" if it was passed invalid arguments. 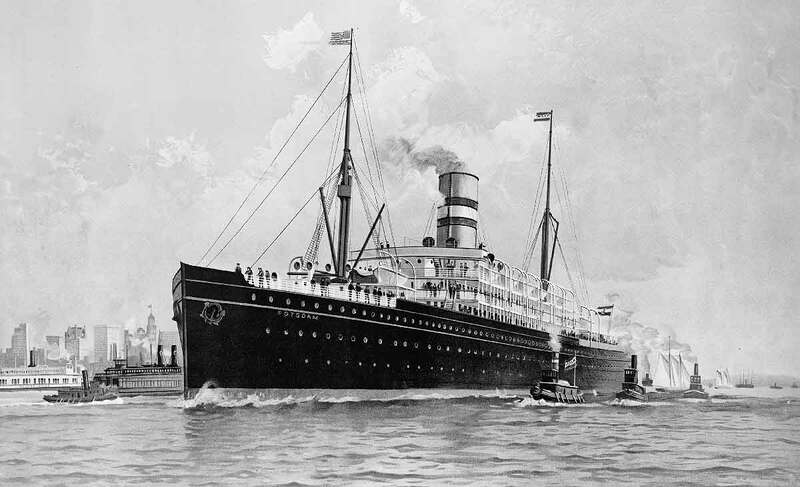 Image: Steamship in Potsdam Harbor, circa 1900. ← We Need More Headlines Like "No Evidence For Flossing"